In the early 1930s, most cars manufactured in Germany were luxury models and the average German worker with a monthly income of ~ 32 Reichsmarks could afford nothing more than a motorcycle. In 1933 Adolf Hitler demanded the production of an inexpensive automobile capable of transporting two adults and three children at 100 km/hr. 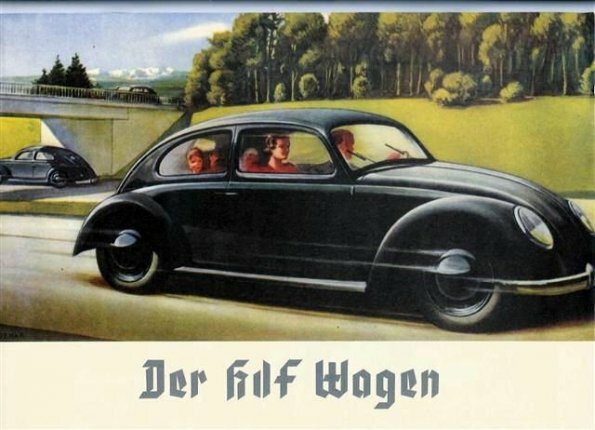 When it became apparent that private industry could not turn out a truly inexpensive car, Hitler chose to sponsor an all-new, state-owned factory using Ferdinand Porsche’s design to manufacture a Volkswagen (People’s Car) that would be available to German citizens for 990 Reichsmarks through a savings plan. The new VW factory in Wolfsburg turned out only a few civilian models before the war broke out in 1939 and production was changed to military vehicles.